The year was 1896, the woman was Alice Guy-Blach , and the film was The Cabbage Fairy. It was less than a minute long. Guy-Blach , the first female director, made hundreds of movies during her career. Thousands of women with passion and commitment to storytelling followed in her footsteps. Working in all aspects of the movie industry, they collaborated with others to create memorable images on the screen. This book pays tribute to the spirit, ambition, grit and talent of these filmmakers and artists. With more than 1200 women featured in the book, you will find names that everyone knows and loves--the movie legends. But you will also discover hundreds and hundreds of women whose names are unknown to you: actresses, directors, stuntwomen, screenwriters, composers, animators, editors, producers, cinematographers and on and on. Stunning photographs capture and document the women who worked their magic in the movie business. 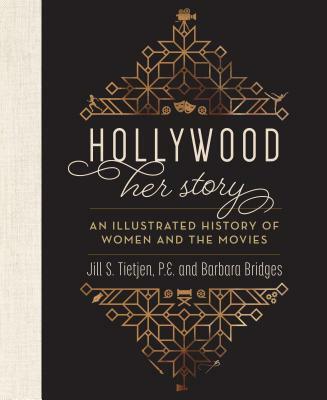 Perfect for anyone who enjoys the movies, this photo-treasury of women and film is not to be missed. Jill S. Tietjen, P.E. is an author, speaker, and electrical engineer. She is the co-author of Her Story: A Timeline of the Women Who Changed America, which received the Daughters of the American Revolution History Award Medal. Jill has conducted research into historical women around the world for the past thirty years and speaks around the country about women's contributions to history. One of the top historians on women across all fields of endeavor in the U.S., she works to bring more visibility to women through her continual nominations of historical and living women for national, state and local awards. Her nominees have been successfully inducted into the National Women's Hall of Fame, the National Inventor's Hall of Fame, and a number of state women's halls of fame. Jill is often profiled and quoted in the media, and her articles have been printed in a wide variety of publications. She has received numerous awards and has been inducted into the Colorado Women's Hall of Fame. Barbara Bridges has spent much of her life as an entrepreneur and businesswoman. In 2006, she founded Women+Film, a program in partnership with the Denver Film Society, where she has been bringing audiences together with films, by and about women, that ignite discussions around global issues facing women today. With the annual Women+Film Festival, a section of movies in the Denver Film Festival and movie screenings throughout the year, it is a popular film program that not only entertains but educates and inspires as well. Barbara speaks to various groups about the role of women in the movies and has been involved with various film festivals. The Denver Post named her one of Colorado's Top Thinkers in Arts and Culture. Barbara has served on the boards of several women's organizations, both locally and nationally, and has received numerous awards as a result.